New Packrafts on the Market! Since writing the post about New packrafting toys two years ago a lot has happened on the packrafting market. And on the other hand, not so much has happened: it’s still the same interesting growing niche sport. But, there are new boats worth a mention! Alpackraft Gnu with Vectran fabric and sraydeck. Photo stolen from Packrafting-Store website. Two years ago I wrote about the Alpackraft Explorer 42. Since then Alpackraft released the Gnu: a two-person white water capable packraft with a spray deck and somewhat resembling a miniature two-person canoe. Moro photos and detailed specs on the Packrafting-Store website. For the Europeans wanting to try the Gnu it’s again available for rent from Packrafting Store! Now that I’ve tried the Explorer 42 I’m finding the Gnu to be very interesting option. 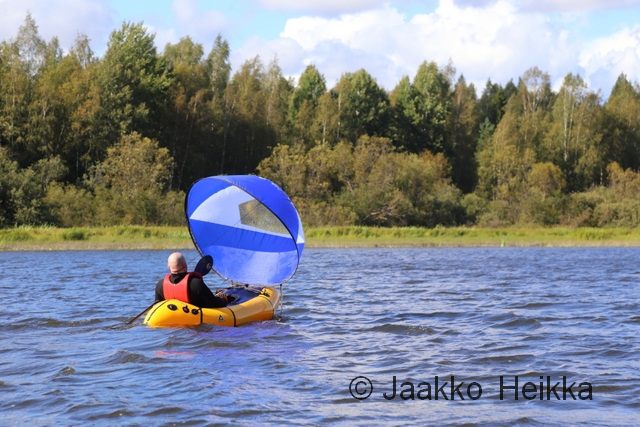 Sharing a raft (with enough room for both to paddle…) is refreshing and great fun and feels especially well suited for lakes and easy rivers which are plentiful here in Southern Finland. The Gnu would offer more hull speed and more floatation than th EX42 which would be welcome. And of course there’s the option to use the spraydeck. Spraydeck might be very welcome in some situations even though I wouldn’t see myself using the Gnu for any serious white water (difficult class II or above). Alpackaraft white water packraft. Photo stolen from the promotional website. Gnu is already old news for most but the latest thing from Alpackraft is pretty new: The yet-to-be-named Alpackaraft white water specific packraft. It’s a turn-key white water package with no need for glueing attachments for thigh straps or other DIY modifications. It’s still clearly a packraft but quite a different boat: the hull is longer and narrower than the Denali Llama, the bow is more pointy and there’s more rocker. It comes with a refurnished cockpit, white water spraydeck, knee braces, Cargo Fly, etc. The price is that it’s pretty heavy at 4,5kg, nearly one kilo heavier than a Denali Llama with white water spray deck and Cargo Fly. And it also costs 1900 USD. But if you compare the weight and price to similarly equipped raft and take into account all the DIY work required and the added performance it’s not actually that bad. The big questions is: do you need that extra performance? Personally I’d love to try the new raft but I don’t think I’ll need the added performance anytime soon so I’ll opt saving my money and carrying little less for now. Kokopelli Hornet. Photo stolen from Kokopelli website. The crowd-funded Kokopelli Raft company is now selling and shipping their packrafts. For me it seems that all the models are based on the same symmetrical hull design and the difference is whether it comes equipped with or without a spray deck and/or Cargo Fly type inner storage option. It seems the design and solutions are pretty similar to those of Alpackrafts but there are also some differences. 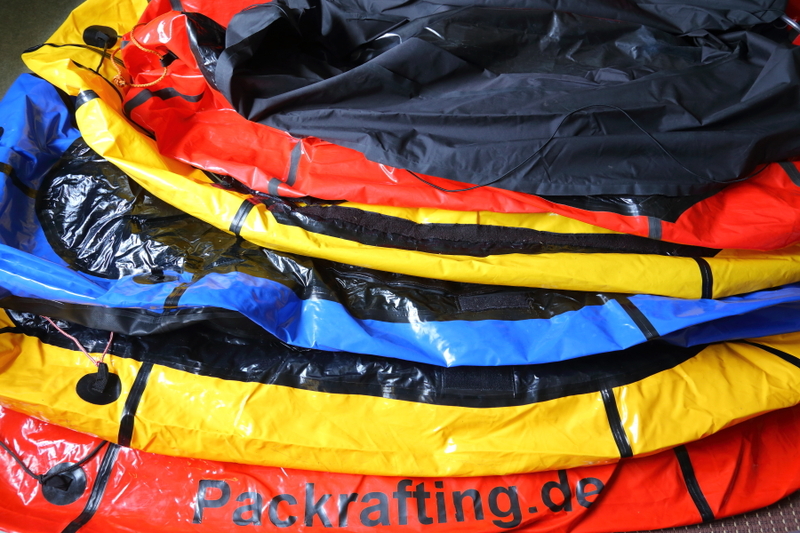 The rafts are heavier than Alpackarafts but also use burlier materials (floor: 840den vs 210den and tubes: 210den vs 75den, though the coating is the key here…) and are roughly the size of Alpackraft Explorer. The hull is made of two symmetrical sections with separate valves and eight attachment points. The Kokopellis don’t come with a seat or backrest but with a detachable inflatable floor (by NSR?). Some may appreciate the sturdier fabrics and most will probably welcome the cheaper prices: the basic Kokopelli Hornet sells for 599 USD (compared to 945 USD for the Alpackaraft Unrigged Explorer). Again something I might like to try but probably not going to buy as I don’t see it offering any advantages over my current packraft. But a lower cost option is always welcome and will likely help making packrafting more popular. The Kokopellis also seem like a great option for bikerafting or for people sharing a raft on easy waters or rafting with a canine companion. The Aire BAKraft on a test run. Photo stolen from Forrest McCarthy’s blog. The very latest boat on the waters is the BAKraft by Aire named Hybrid SBF. Forrest McCarthy blogged about this self-bailing vessel that seems like a hybrid between an inflatable kayak (Aire’s main business) and a classic packraft. The outcome is very interesting and also different to the classic packraft designs: it looks like a short IK, comes with a self-bailing floor and Aire thigh straps and the hull is constructed of urethane bladder covered with separate layer of Dyneema for high-strength protection. Size-wise its shorter and wider than Alpackraft Alpacka but as the design is very different the comparison on this level doesn’t probably make much sense. It weights under 3 kg with the self-bailing floor and backrest so it’s actually quite light. The beefy Aire thigh straps (also widely used as a DIY modification in Alpackarafts) add about 0,5kg. There’s some room to stove gear in the stern but apparently Cargo FLy type solution for stowing gear inside the tubes is in the making. The Hybrid SBF will be available in 2015 for RRP of 1200 USD. In addition there is a cheaper (and likely lighter) non-selfbailing version, the Hybrid Lite, coming too. 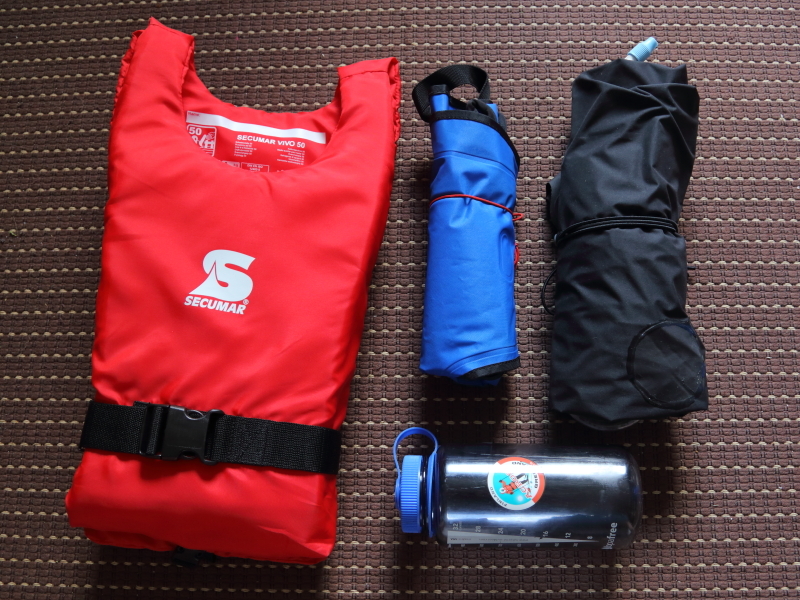 From right: simple oam PFD, Anfibio Buoy Boy inflatable vest and Supai Flatwater Canyon II packraft . A Nalgene for scale. In addition to the full-sized and super capable packrafts there’s the sub-segment of superlight one-person rafts suitable for crossing lakes and rivers on hiking oriented trips, fishing on remote lakes, etc. – The traditional boat and sort of benchmark in this category is Alpackraft Scout (1660g) being the most robust boat in the group. – Supai Adventure Gear Flatwater Canyon II is the lightest boat in the group at 680 g with good design but small size and light materials. – Klymit has the LiteWater Dinghy (LWD). The weight is reasonable 990g as is the price but based on what I’ve seen I’m not convinced by the design. – Ruta Locura sells an ultralight version of the LWD called LWD-UL made of thinner fabric and thus being lighter (790g). – FlyweightDesigns has updated the Flytepacker and it’s now called CrossFlyte and has an inner part (740g) and detachable skin (850g) for added robustness (total 1590g). – Advances Elements Packlite Kayak is more like an ultralight “pool-toyed” IK but at 1800g and with reasonable price it fits the segment well. A client packsailing upstream the Kymijoki on my packrafting course in August. In addition to the new rafts there are also new accessories which open up new ways of using the pakcrafts with packraft sailing being the latest thing. Packrafting-Store sells a kayak sails sized for packrafts and Joni and Marko have been pioneering the packsailing in Finland and Joery is also pushing the limits of packsailing by sailing the Belgian coast line (67km) in one day! Being able to cover over 60km of flat water in a packraft in one day is pretty impressive! Packsailing is of course highly weather dependant (as is packrafting on flat water in general) but with the sail weighting only around 400g it makes sense to carry one just in case if the route includes long sections of flat water. Edit: Post edited on 2.10. as I got new infromation: Alpackraft Gnu is again available for rentals from Packrafting-Store and the weight of the Aire Hybrid SBF BAKraft doesn’t include the thigh straps. FYI: Post edited on 2.10. as I got new infromation: Alpackraft Gnu is again available for rentals from Packrafting-Store and the weight of the Aire Hybrid SBF BAKraft doesn’t include the thigh straps. Great overview Jaakko, thanks for that. I hope we will continue to see evolution and new players on the market. As I mainly use my raft on long thru-hikes, I would love to see lighter packrafts which are able to handle up to class II water, without making too many compromises on the durability. The small dinghies are just not interesting as their hull speed is too low to make serious distances on flatwater. I’m currently torn between the Yukon Yak and the Curiyak. I’m not likely to do any serious white water stuff – more hiking/rafting trips so less weight good but would like option of spray-deck. Do you know anyone who has done a DIY spray-deck for a Curiyak, or how difficult do you think it would be? Hi Nigel. I knwo the feeling, I’d love a decked Curiyak or similar boat myself too. I have vague memory of someone making a IY spraydeck which shouldn’t be too difficult but will of coruse add weight. Now that the Packrafting Sotre sells “Microraft” http://www.packrafting-store.de/Packrafts/MRS-Microraft-with-removable-deck::608.html it might be just the thing you are looking for? Unless you want a genuine Alpackraft. Are you saying that the MRS Microraft can’t handle white water? I am currently looking into getting a raft and the MRS option is about all I can afford. Did I say so somewhere? Hopefully not as the MRS rafts handle white water very nicely. They are different to Alpackrafts (bigger tubes, bigger stern and more rocker in the bow) but I’ve seem them doing very well in class 2 white water and with capable paddler probably would do just as well in class 3-4. They probably also offer better edging than the classic Alpackrafts (assuming thigh straps or similar to enable control) because of the smaller tubes. MRS rafts are good value for the money expecially now with euro being so weak against the dollar.